2 I am going to make Jerusalem a strong drink that sends all the surrounding peoples (Muslim nations) reeling (they will act inebriated). Judah (West Bank) will be besieged as well as Jerusalem (2-State Plan). 3 On that day, when all the nations of the earth are gathered against her, I will make Jerusalem an immovable rock for all the nations. All who try to move it (divide it and give it to the Palestinians) will injure themselves (find themselves in God’s crosshairs). Governments around the world are turning against the Jewish State and putting themselves and their people on a pathway to judgment. Eight of 15 member states of the UN Security Council hold an emergency meeting about Trump’s recognition of Jerusalem. UN Special Coordinator for the Middle East Peace Process Nikolay Mladenov addresses the Security Council on the US decision to recognize Jerusalem as Israel’s capital [AP Photo]. 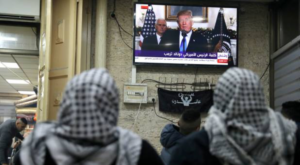 Riyad Mansour, the observer for Palestine at the UN, said the Trump administration has violated “Jerusalem’s legal, political and historic status and the Palestinian peoples’ rights and legitimate national aspirations”. 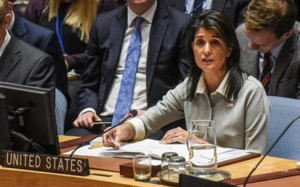 Nikki Haley, the US ambassador to the UN, resoundly rejected the criticism from other countries at the meeting. 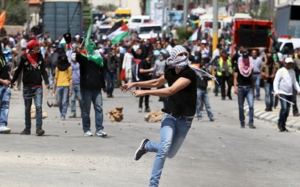 Hundreds of Palestinians injured in clashes with Israeli forces in West Bank; IDF increases forces throughout West Bank and Jerusalem. 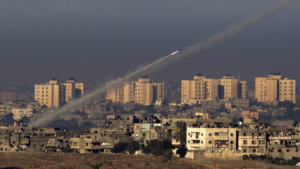 Israeli Air Force responds to rocket fire from the Gaza Strip into southern Israel. The IAF retaliated with airstrikes hitting two terrorist positions in the Gaza Strip. In my 40 years of studying prophecy, I’ve never seen a stronger sign that we’re living in the last days then the world’s response to Trump’s announcement to move the US embassy to Jerusalem. The world reaction speaks volumes about how close we are to the coming of the Lord! 100 years ago, no one showed the slightest interest in Jerusalem. Today, it has become the world’s biggest controversy and“strong drink” to the nations. What President Trump is doing is one of the most courageous political things that’s been done in Washington in a long time. 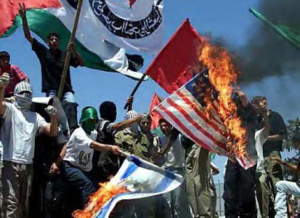 Clinton, Bush and Obama talked about moving the embassy and declaring Jerusalem as the eternal capital, but they did nothing. The biblical timing of Trump’s Israel decision is of absolute precision!Jerusalem is God’s red line. The land of Israel was an eternal land grant given to the chosen people and has never been rescinded (Jer. 31:35-37). Notice several things in Zechariah’s prophecy (above) about Jerusalem in the end times (Zech. 12:2-3). The prophecy portrays God in his kitchen mixing up a strong cocktail for Israel’s enemies in the end times. His potent formula makes Jerusalem and the West Bank become an intoxicating drink to the nations. It is God, not Donald Trump who is making Jerusalem and the West Bank a strong drink to the nations. 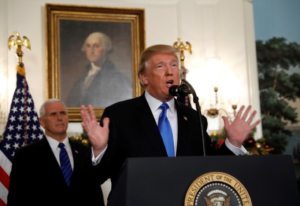 The Lord appears to be using President Trump as His instrument to poke at the nation’s sore spot called Jerusalem. Here’s what that means. Imagine God in heaven stirring a large vat with a stick. The large vat is a thick, sticky, stinky batch of Jerusalem with holes in the bottom that keeps dripping out onto the surrounding nations around Israel and the world. After a while, the nations begin to get drunk over this strong drink called Jerusalem. The drink makes them overconfident so they start ranting and raving and acting like drunken bullies, “they ravaged and crushed you (Israel) from every side so that you became the object of people’s malicious talk and slander” (Ezek. 36:3). In God’s sovereign plans, when their hatred is boiling over and they can’t take it any more, God will urge them (like pulling in fish on a hook – Ezek. 38:4) to attack Israel – this ends badly for Israel’s enemies at the Battle of Armageddon. Keep in mind that the prophet saw all this was going to happen just before the Second Coming (Zech. 14:3-4). That’s where we are today! 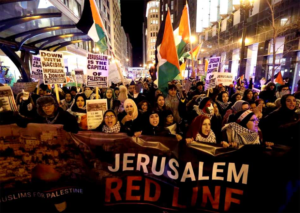 The world will turn against Israel (Mt. 24:9), seek to divide the land of Israel (Joel 3:2) and then tear Jerusalem in half and steal half of Jerusalem (East Jerusalem) away from Israel (Zech. 14:1-3; Mt. 24:15). In the Abrahamic Covenant, God’s promises are clear and unchangeable. He promised to bless those who bless Israel and to curse those who curse Israel (Gen. 12:1-3). America is at a crossroads and we should be praying for President Trump to have the wisdom to lead this great nation into God’s blessing. We should also pray for the peace of Jerusalem, as Scripture implores us to do (Ps. 126:6). We should also pray for her safety and prosperity, not to man-made institutions and international efforts, but to the God of all Peace, and to the greatest Jew to have ever lived, Jesus Christ.